Boutique Studio – Big Results. 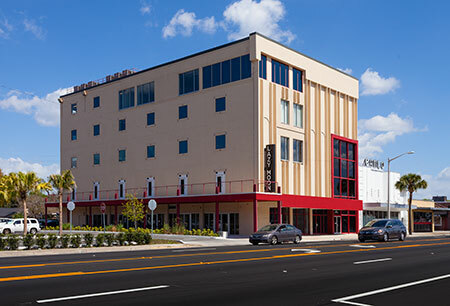 In the heart of downtown Orlando, The Blackburst Studio is an ideal facility for broadcast television production, video production and live shot studio work. Our boutique studio is optimized for small and medium sized productions with respect to the amount of space required and the number of personnel it will support. 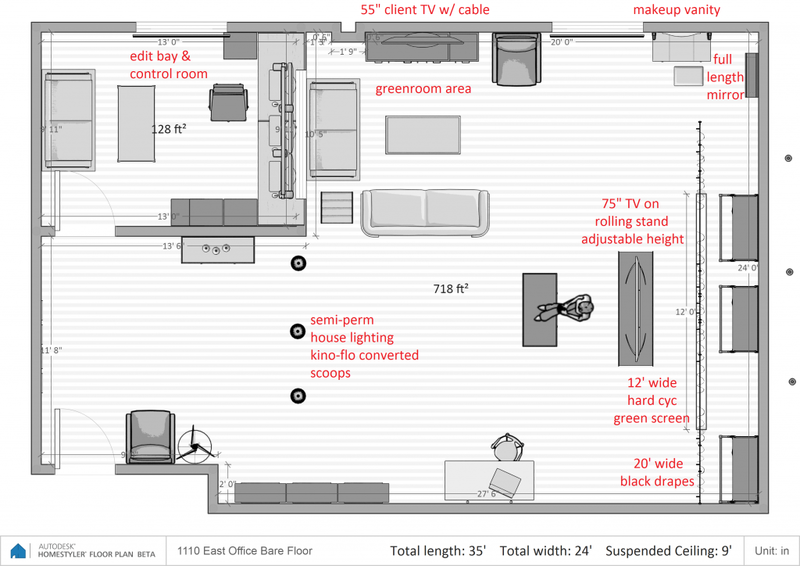 With just under 1,000 square feet of space overall, it is ideal for shoots with a crew of 10 or less. There is a separate control room / edit bay flex space, offering a partitioned area to monitor your shoot from. What’s better than a studio? A connected studio. 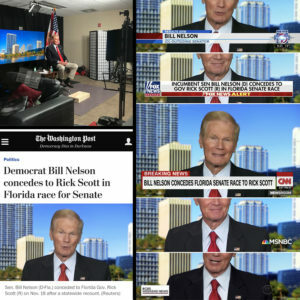 Blackburst’s live shot studio space is connected to the major broadcast networks, cable networks, tv stations, satellite relays and other facilities via an LTN Global HD video transmit & receive connection. You can Go Live or to tape right from our studio. If your show tapes in New York and you want talent in Orlando to join the conversion, we have you covered. Our HD-SDI video uplink combined with hardwired IFB audio & PL intercom connections seamlessly link us in to your production control room. News talk-backs and satellite media tours are a perfect fit here. 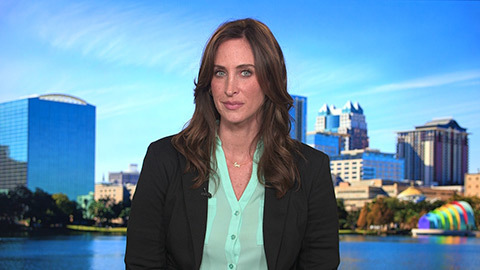 We support live news feeds, sports shows, and talk shows, as well as corporate communications. We can bring you Orlando based speakers to your convention stage in any city in the world, live in real-time. Reach your audience online. Whether it is a webinar, a live keynote presentation, an online panel discussion, corporate, educational, or entertainment, we can help you communicate on the web. 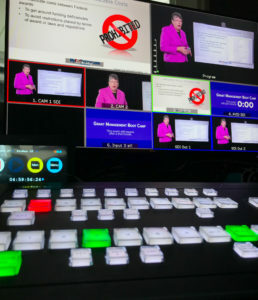 We can provide live webcasting to all the major platforms; from just the basics – a studio environment with a dedicated internet connection – to a full production with video, graphics and music. Social media is big business and in the world of social media, images convert better than plain text, video is better than just images but LIVE video is the gold standard for interaction. 59% of executives would rather watch video. 92% of mobile video users share video content. People watch live videos 3x longer than non-live and comment 10x more on live videos. We can take your Facebook LIVE or YouTube LIVE videos to the next level. Our Live Studio and professional crews broadcast your message in a clean, professional manner that you can’t acheive with just a smart phone. Let us be a part of your live social media success. 20 ft wide back drape background. 12 feet wide x 9 ft tall hard cyc for chroma key and solid color backgrounds. Various 12 foot wide photo paper rolls and textured muslin fabrics. 75″ HDTV with city skylines and other scenes to be used as backgrounds or a prop. The studio has an open-concept green room space inside the studio space. Couches, cable TV, refreshments & hair / makeup area create a comfortable and useful space for talent. It should be noted that the green room area is open to the studio space and not separate. 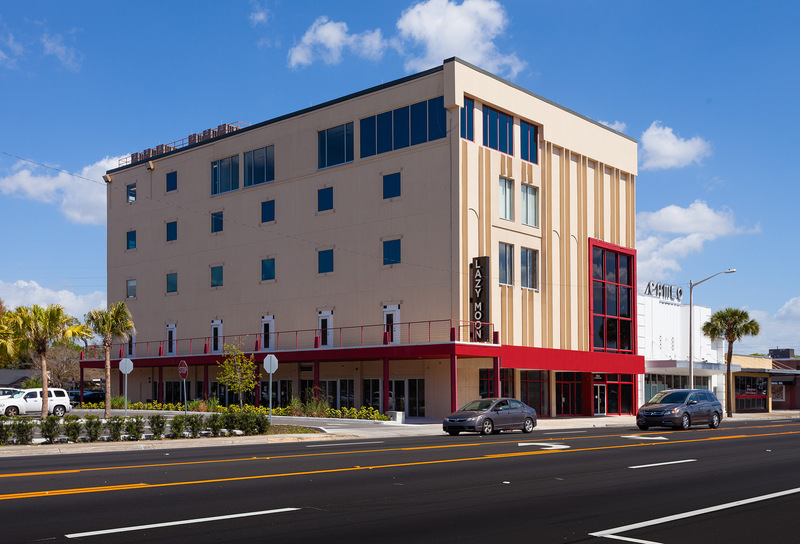 New in 2017, Blackburst is now very conveniently located in downtown Orlando on the corner of East Colonial Dr. and Mills Ave. We’re right in the heart of Orlando’s creative district, less than 5 minutes from I-4 and the city center. There are dozens of restaurants and several lodging options all less than a mile from our studio’s location. We also have a dedicated parking lot for easy load-in and out. We’re a small studio that thinks big. Get connected to the media universe and put your message out there. Go point to point to send live or taped HD video to a specific broadcaster or let us put your signal on a satellite orbiting 20,000 miles above the earth, to feed video to hundreds of outlets around the country in an instant. 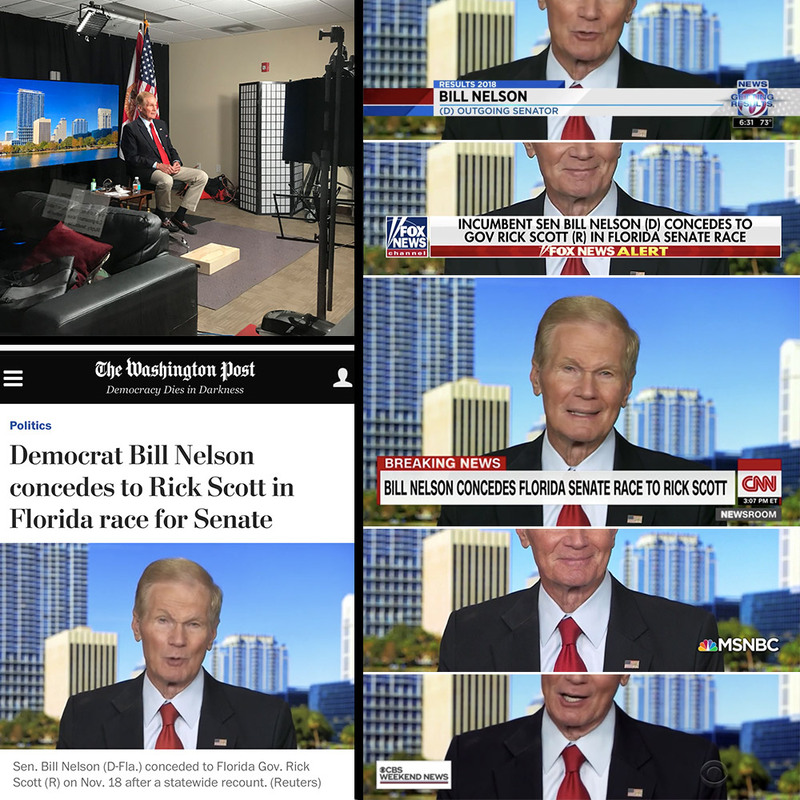 Blackburst worked with the Nelson for Senate campaign in 2018 to get strategic messaging to the masses via placing content on YouTube when appropriate and putting content on satellite for live distribution when necessary. 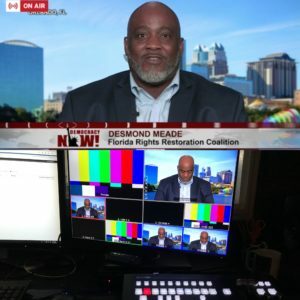 We also worked with representatives for Florida’s Amendment 4 campaign, providing live shot support for Democracy Now’s daily news program with campaign leader Desmond Meade. There is just under 1,000 sq ft total. We have all the amenities you’ll want for a shoot: camera & audio equipment, lighting, monitoring, makeup area, meeting area, couches that will slide around to accommodate your setup… Take a look at a simple floor-plan below. Provider: LTN – fully-managed and cost-effective Global IP Transmission service. Type: Broadcast quality, point-to-point or point-to-multipoint live video. Pre-lit studio for live shots and green screen. KinoFlo & Litepanels sources with base level of f/4 @ ISO 800. 75″ HDTV for video and still image backgrounds for live shots. 12′ x 9′ chroma key wall.